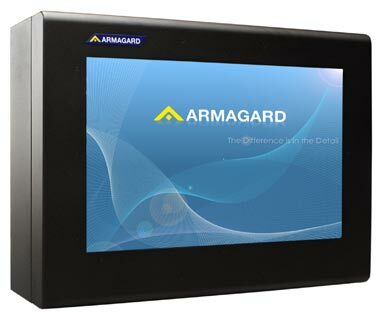 Last updated on November 15, 2011 January 21, 2014 by Richard N Williams for Armagard Ltd. Outdoor digital signage is increasing in popularity. More and more digital screens are placed along high streets, storefronts and roadsides every day, with outdoor digital signage one of the fastest growing advertising mediums around. And it’s not only advertisers that are using digital signage in outdoor environments; information screens outside schools, libraries and transport hubs provide an effective platform for communication and messaging. While it’s important to ensure any outdoor screen is waterproof and protected from the weather, it is equally important to ensure that the signage can handle the variable temperatures of an external environment. The temperature in outdoor areas can vary from one extreme to the other. In summer, an outdoor screen may have to cope with sweltering temperatures, which can lead to overheating and eventual failure of the screen. In winter, the opposite problem occurs and the need to prevent screens from freezing is also essential to prevent failure. Whether designed for outdoor use or standard devices housed in outdoor LCD enclosures, all LCD screens have a limited temperature range. Once exceeded, a screen will soon fail so for continuous operation, keeping the screen within this temperature range is critical. Outdoor digital signage is particularly vulnerable to overheating in hot climates or throughout summer. Screens, as with any electrical appliance, produce a certain amount of heat throughout their operation. Not only does this heat have to be transferred away, but the effects of ambient heat also require consideration. For a screen designed for outdoor use, there are different methods of heat expulsion employed, but the display will have a finite maximum as of ambient temperature it can operate in. However, the difficulty with estimating ambient temperature is that you never know for sure exactly what the maximum temperature will be. In some locations, while summer may generally be mild, heat waves and freak temperature could occur, and possibly disable a screen, so erring n the side of caution is always advisable. Freezing temperatures, especially during wintertime are also disabling for an outdoor digital signage display. In some locations, extreme cold is more common, and outdoor digital signage needs protection especially from sub zero temperatures. Again, erring on the side of caution is always the best option, with areas that regularly receive sub zero temperatures requiring heating systems that automatically switch on whenever temperatures drop too low. With an LCD enclosure containing heaters, cooling fans and other temperature control components, an outdoor screen can function safely throughout the year, without becoming disabled by freak weather occurrences that can quickly disable the display. This entry is filed under digital signage enclosure, freezer enclosure, lcd enclosure. You can follow any responses to this entry through the RSS 2.0 feed. Both comments and pings are currently closed.